Impressive Hackney driving head burnished and two-toned. 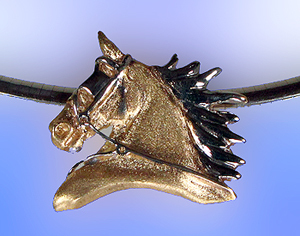 The Gorgeous Horse is your source for Hackney jewelry. Hackney harness with a beautiful full mane. This one pictured here has the satin finish applied, you can see how the blind, mane, and rig are easily seperated from the head. This allows for great detail to be noticed. For a real cool design try the mane set with diamonds and rhodium plated for a white sparkling finish.